Traditionally, fried rice is a meal in itself. 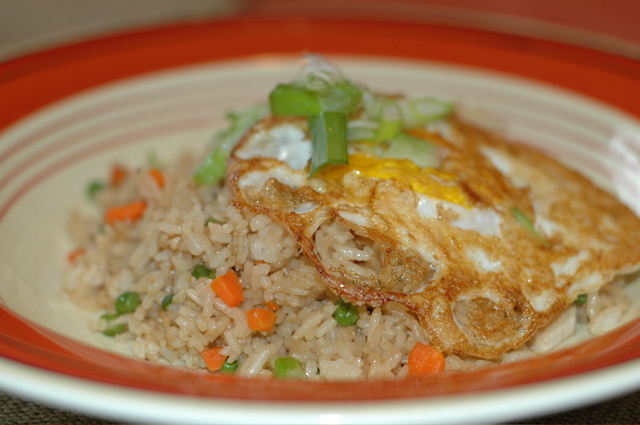 It contains meat, veggies, eggs, rice- everything you need for a delicious, filling meal. Yet, it is fast and easy to make. If you use leftovers, like I do, it's also economical. The dish I make is more Chinese style, rather than Thai style. It contains oyster sauce and soy sauce, rather than fish sauce. I don’t buy ingredients with the purpose of making fried rice. I use whatever I have on hand. Today it was left over roasted chicken, carrot, frozen peas and green onions. If you don’t normally have leftover rice lying around (which I normally do), make it the evening before and stick it in the fridge. Instead of adding eggs, I serve fried over-medium eggs on top. It is important that the rice is cold. Otherwise you’ll get a mushy fried rice. Break up any big clumps (but don’t mash it). Mix together the oyster sauce and soy sauce in a small bowl. In a hot wok on high heat, heat 1-2 tbs oil (I like using peanut oil for a little extra flavor). Add the garlic and fry for about 15 secs (don’t let it burn). Add the peas, carrots and eggs. Fry for about 30 seconds, then add the rice and meat. Let it sit for about 30 seconds before stirring. Turn the rice in the wok, breaking up any clumps. Give it about 10-15 seconds between each turn. After about 4 or 5 minutes, add the sauce mix (if you used 6 cups rice, add only about ¾ of the mix) and the scallions. Continue to stir fry until heated through, about 5 minutes. Adjust the seasoning if necessary. Garnish with scallions and cilantro. Try experimenting with different vegetable and meat combinations. The only thing I would recommend is using fresh veggies whenever possible. They contribute more flavor to the dish. Frozen veggies often get soggy and their flavors get lost behind the oyster sauce and soy sauce. Try snow peas, snap peas, bean sprouts, bell pepper, green beans, asparagus, etc. Occasionally, I purchase Chinese roasted pork from the Asian deli (they even have it at my regular supermarket deli now) because this is sonny’s favorite. Don't forget the chopped up kimchi to make it Korean-style! And chopped Spam, too, if you are from Hawaii. Copyright © 2011 Blazing Hot Wok. Awesome Inc. theme. Powered by Blogger.